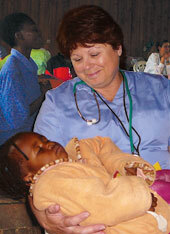 NorthBay Healthcare Vice President and Chief Nursing Officer Kathy Richerson says a trip to Kenya in 2007 with the faith-based E3 Partners restored her confidence that as a nurse, even when you’re not involved in direct care, your core nursing skills and knowledge don’t go away. “There’s still so much that you can do as a clinician to help other people,” she says. Kathy got that chance during a 10-day medical mission, in which she was part of the triage team, evaluating patients’ medical needs, giving them basic medication and directing them to the appropriate station for further help. In that short span, the group – which included two other NorthBay employees, Dan Hartley and Susan Rosten – saw more than 2,400 patients. “The Kenyan people are very patient and will travel long distances to get help,” Kathy explains. Still, they had to turn almost 1,000 away. “That’s the part that just breaks your heart,” says Kathy. Kathy has worked nine years at NorthBay, and while the trip to Kenya in 2007 was the first she’s ever taken, she promises it won’t be the last. It also provided her with a great opportunity to visit her son and his family, who were missionaries at the time in a Kenyan community about 90 minutes away from Njoro.